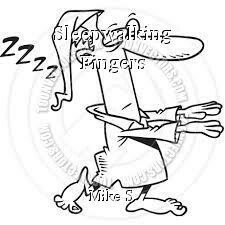 Sleepwalking Fingers, poem by Mike S.
My sleepwalking fingers type nonsense. Sleepwalking fingers -- now there's a thought! Excellent poem, Mike! Thank you, Hull, and it can also sound very dirty! Nice use of repetition in the poem. A great poem overall. This should be included in my " About the Author" last page, you know the one with the goofy picture of myself at the end of my book ! Perfect, and right on, Mike !